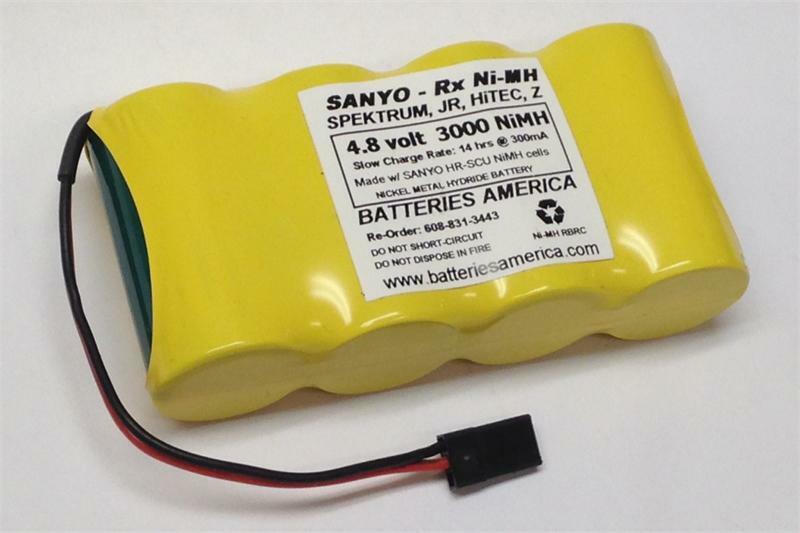 4HR3000SCU : 4.8v 3000mAh Sub-C NiMH battery for RC. Choose shape & connector. Home > RC Hobby > Receiver Battery Packs > 4HR3000SCU : 4.8v 3000mAh Sub-C NiMH battery for RC. Choose shape & connector. 4HR3000SCU : 4.8 volt 3000mAh rechargeable NiMH battery for RC. These are premium-quality NiMH cells (new FDK cells, same production lines as the old SANYO cells). Choose pack Shape, and choose Connector (or just Wire Leads without connector). Cells are Sub-C size. Each cell is approx. 1.75" tall x 0.88" diameter. Flat pack dimensions: approx. 3.6" long, 1.75" tall, 0.9" thick. Square Pack dimensions: 1.75" tall, 1.8" across, 1.8" deep.(cube). Available connectors to choose: (1) Futaba J; (2) SPEkTRUM-JR-HiTEC; (3) AIRTRONICS old style. (4) JST-GWS (red 2-pin). Add extra power leads with EC3 connector for $5.00 more. Available Shapes to choose: Flat (side by side); Square; Offset. These battery packs are made in the USA by BATTERIES AMERICA. 4N3000CRW: 4.8 volt 3000mAh Ni-Cd "C' size receiver battery pack. Made with N3000CR NiCd C cells. Choose Pack Shape, and choose wire leads or Connector from scroll-down menus. Pricing reflects options chosen. 4EP5000SC : 4.8v 5000mAh rechargeable LONG LIFE Ni-MH receiver battery. Made with Sub-C size cells. Choose shape and connector. 5EP4200SC : 6.0v 4200mAh rechargeable Ni-MHbattery packfor RC hobby. Made with 4200mAh Sub-C cells. Choose shape and connector. 5EP5000SC : 6.0v 5000mAh NiMH Rx battery pack. Made with premium NiMH Sub-C size cells. Choose shape and connector. 4KR5000DEW: 4.8 volt 5000mAh rechargeable Ni-Cd large-scale RC receiver battery pack. Made with 4 x KR-5000DE "D" size cells. (Pack weighs about 1.4 pounds). Choose Pack Shape, and choose wire leads or Connector from scroll-down menus.